Everyone knows that diet and exercise are the big duos for slimming down. But what about those lesser known gems which encourage fat loss, promote lean muscle mass and boost general health? The truth is, changes to diet and exercise habits can be thankless endeavors in the short-term. Most people just aren’t prepared to change their lifestyle without a taste of the rewards to come in the first few weeks, and I don’t blame them. What you need is something to get the fitness ball rolling. Something that will give you consistent strength, confidence and the feeling that you are making progress. We live in modern times, people. The science is out: we pretty much know how to help ourselves do this, and people who proactively seek out nutritional supplements are reaping the rewards. This is why I decided to talk about some of the most tried and tested supplements on the market. To explain what they are, and to tell you how they work. This article will list the 4 best supplements for cutting; the right way. Just know that they work wonders for boosting energy, muscle recovery & immune regulation. In a sentence, the most important thing to understand about BCAAs is that they are the building blocks of protein. This is what allows them to be such effective tissue repairmen (or repairwomen, if you wish), enhancing muscle recovery and working to assist with immune regulation. BCAAs have a long list of added bonuses, too. For example, they assist with protein absorption (very handy for those of us taking whey protein), enhance ATP production, and can even increase growth hormone levels. I consider these added bonuses because even without them I would take BCAAs. Let me give you the final reason for taking BCAAs. It has to do with something called catabolism, which is a fancy word for the breaking down of molecules. For us, specifically, this is to say that BCAAs act as great preventatives of muscular catabolism. They ensure you don’t lose the muscle mass you already have (or the gains you are making), even while burning more calories than usual. This is so important for taking the next step on your weight loss journey, since working muscle is what’s needed to keep you burning fat. It’s one thing to shed large amounts of mass while throwing the muscle out with the proverbial bath water: It’s another thing to stay strong while losing excess fat. Let’s just take a second to clarify: Sadly, this is not the same as the Nitrous Oxide (N2O) used to pump up your engine (any Need For Speed Underground fans out there?). Then again, if you think of your body as an engine, the metaphor can work quite well. Nitric oxide (NO) is a vasodilator. A substance that helps to relax the muscles lining your arteries, allowing them to open wider (dilate). This increases blood flow and lowers blood pressure. There is a reason that obesity is linked with high blood pressure. A couple of reasons, actually. Most importantly, fatty tissue has a habit of making its home in arteries. This puts a lot of strain on the heart, since it needs to force blood through a less than an ideal pathway. With blood flowing easily to working muscles, the first thing you will notice about nitric oxide boosters is the incredible pump during your workout. Arnie was big on the pump, and you should be too. Not just for the added girth when flexing, but because a good pump is exactly what working muscles need in order to function properly. For losing weight, it’s important to increase your repetition range. Upping that 8 set to a 12 is tough, but boosting your nitric oxide production can be the key to doing it. Improving sleep quality, so that your body can recover and do it all again the next day. Magnesium is a mineral, found in the human body and throughout the planet. It’s a chemical element, which makes it fundamental. In fact, magnesium is present in every single cell in your body: so yes, it can play a major role in your health and well-being. The concerning thing is to learn that approximately one in two Americans are not getting enough magnesium. While that may not sound like a big deal, it kind of is. Magnesium plays a role in over 300 biochemical processes within the body. It helps in energy creation, forming proteins, preventing heart disease and has even been shown to enhance brain functions like learning and memory abilities. One study, performed on professional volleyball players across Europe, found that magnesium supplementing not only allowed for better muscle recovery, but it increased professional athletic performance. In a sport which revolves around jumping, this leads to athletes increasing their verticals with no change in athletic training–only the addition of magnesium supplements to their diet. The implications go beyond professional sport, though. By increasing the workload your muscles can handle, magnesium is crucial for those early stages in weight loss and fitness regimes. It will help you work out for longer, and to make gains that will last beyond the first month. The second reason for listing magnesium is its profound effect on sleep habits. Magnesium glycinate, in particular, has been shown to help melatonin production (the body’s big sleep chemical), increasing sleep time, sleep efficiency, and reducing ‘early-morning awakening’. If you have already tried starting a new healthy lifestyle, you’ll know how tired your body and mind can feel after the first invigorating week. The key to long-term improvement is ensuring that you are able to reset at the end of each day, and there’s no better to do this than get a good night’s sleep. If you are getting serious about your fitness, there’s really no avoiding protein supplements. For this reason, the protein market can be a monstrous and overwhelming place. Don’t worry, that’s why you have this guide. Proteins are made up of twenty amino acids, 11 are non-essential, while 9 are essential. Essential amino acids are those that the body cannot produce. This means they need to be sourced; from food or, in today’s world, supplements. Whey protein isolates are complete proteins because they include all nine essential amino acids. They also have an incredibly high protein percentage per serving, which means you aren’t wasting your grams on fillers or carbohydrates. Whey protein supplementation promotes lean muscle tissue growth. And when it comes to weight loss, this is exactly what you should be looking for. Research has shown that whey proteins have significantly increased weight loss in active supplementers, decreasing body fat percentage while boosting lean muscle fibers. 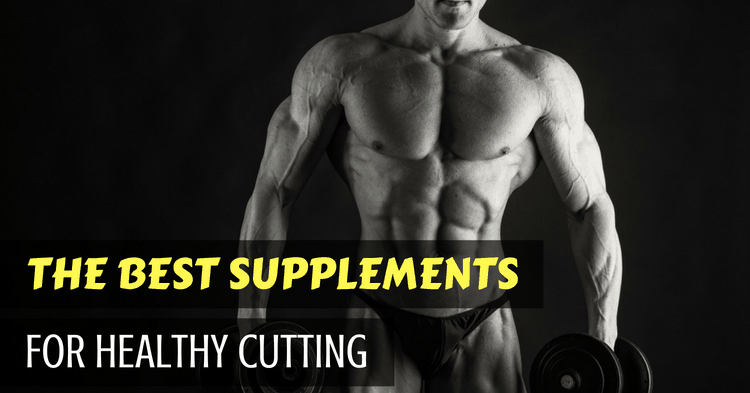 Now that you know something about the best supplements for cutting, this section will tell you what I know about making it last. I think some of this will sound so obvious that it wouldn’t need mentioning, but I assure you: in my experience, it does. There will be times when it feels like your body is rejecting the change, but don’t be discouraged. All that’s happening is your body is telling you that this is something it’s not used to. Imagine you suddenly cut out all sugar, or started running 10km each morning when your previous routine only took you from the bedroom to the living room; you can see how this may come as a bit of a shock to your body. Don’t underestimate the importance of staying healthy while losing weight. The most common setback to fitness routines within the first two weeks is people getting sick. This is the last thing you need when you are trying to cut weight; being bedridden. This holds true in the short and long-term. It’s why I suggest multivitamins as a daily addition in the short-term (or at least a large dosage of Vitamin C in the first month of any strenuous change to routine). And it is also why you won’t see some commercially popular weight cutters on my list. Thermogenics and fat burners may seem the obvious choice when it comes to weight loss supplements, but I have read too many conflicting studies on the subject. That’s why, for the purposes of this article, I stuck with products that have proven themselves safe for long-term consumption. Be smart in your approach to health and fitness. We are living in a world which knows an incredible amount about the human body. We know what makes it leaner, what boosts muscle recovery, energy creation, and which compounds are safe to consume. Each of the four supplements I have discussed is tried and tested winners. They are the products of extensive research; far from being on-the-cusp, experimental-stage chemicals. Improving your body and health is never a quick fix. However, this doesn’t mean that you shouldn’t see some results along the way. Visible gains are the greatest motivators, and I’m all about finding ways to increase self-motivation. Because, at the end of the day, you are the one that will drive the change you want to see. Always take the suggested supplements in their listed dosages, and though I’m sure I don’t need to say it: They work best alongside regular exercise and a balanced diet. Did you find this list useful? If so, feel free to give it a like or share it with your friends. I am committed to producing accurate, up-to-date content and I am open to learning new things–so if you think I missed any of the best supplements for cutting, leave a comment below telling me about it. I would be glad to hear from you! Stay smart, guys. And stay strong.